New recruits for Regiment Andlau are taken through their paces by their Inhaber. 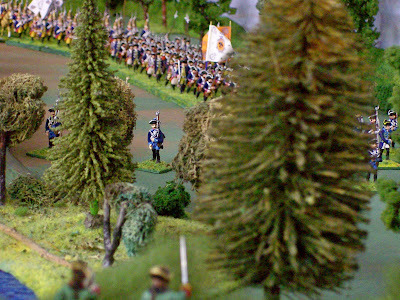 Minden Miniatures painted by Der Alte Fritz (click to enlarge the picture). The Imperium Hofkreigsrath has directed Feldmarschall Leopold von Daun to supervise the expansion of the Empress' s imperial army in order to defend the empire from the vile depredations of King Friedrich II of Germania. The Imperium army was woefully outnumbered by the blue coated Germanians during the first several years of the war. The Empress has decided that an equilibrium in the size of the two nations' armies must be achieved. To that end, recruitment of new troops has commenced at two depots: Freyberg and Prague. The Graf Frey is raising a regiment of cuirassiers (Ansbach CR) as well as several batteries of light artillery to augment his command, while Daun is in the process of raising four new regiments of infantry, a regiment of hussars and a regiment of cuirassiers. Spies have reported that King Friedrich II is preparing his army for an advance from its winter quarters in Dresden. Feldmarschal Daun expects the Germanians to advance up the Elbe River valley and cross into the Imperium borderlands near Lobositz. 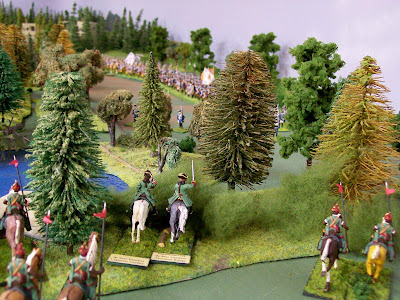 Accordingly, Daun has ordered all available Imperium forces in Bohemia to concentrate at Lobositz prior to Saturday February 7, 1759 (2009) at the Little Wars wargame convention. Sometime in February we will be entering wargame text, photos and all the rest. For now we are getting this site ready for that. We beg your forbearance. Above you see Gallian Lanciers de Saxe observing Hesse-Seewald forces on the march. Click on the two photos above to enlarge them. Scroll to the bottom, waaay down to see more.